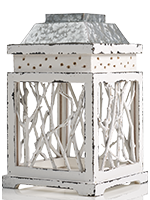 This country chic wood shade features delicate branch work hand-crafted from real trees and then hand-painted a creamy white. 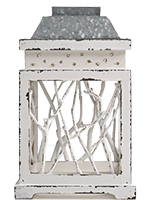 The lantern look is exquisitely crowned with galvanized metal detailing. Measures 7” diam x 11.25” h.